Here is a little script that renders characters to 2d images the way it was done in Diablo 2. So the one will be able to use the images in 2d engines (like GameMaker). Set output path for rendered images. Fake All Actions: make all the actions in .blend file Fake. All actions will be rendered with Render Fake Actions button. 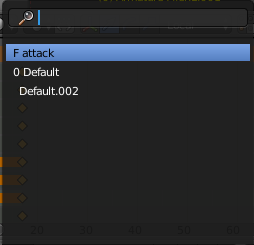 Add-on renders only Fake actions (marked with F in drop-down menu in actions' list). Make Fake actions only the ones you want to render. Fake All Actions button is actually just for the convenience - not to make all actions Fake by hand. IMPORTANT NOTE: never close your file with actions that are not Fake. It may delete them completely from the project even if the project is saved. Unfake All Actions: make all the actions in .blend file unfake. No actions will be rendered with Render Fake Actions button. 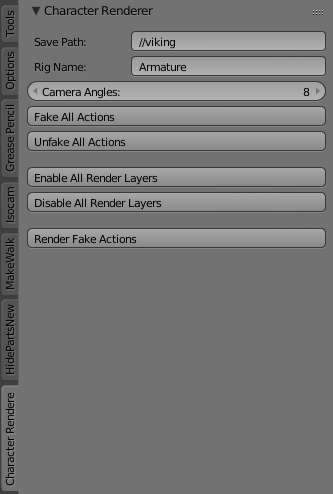 Only selected Render Layers will be rendered with the Render Fake Actions button. Disable All Render Layers: disable all the Render Layers what means that no parts of the character will be rendered. Disable All Render Layers button is actually just for the convenience - not to disable all the render layers by hand. Render Fake Actions: render all the parts of character defined by Render Layers from all Fake actions to specified output path. You also can download this add-on absolutely free from github (without .blend example) But feel free to buy it if you'll find it useful! Thank you!